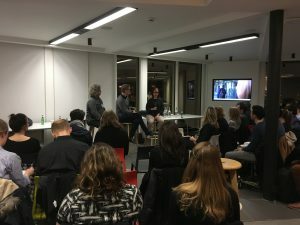 The PRCA joined us at the H+K London office this week to host a panel discussion on how broadcast media works, and how to package stories and make them relevant to the media. Panellists gave advice on how to nurture mutually beneficial relationships with broadcast journalists, and how to pique their interest with niche stories that may not hold the same mass appeal as the latest Apple launch or a high-profile cyber-attack. The panel was hosted by freelance technology broadcaster and journalist David McClelland, who has featured regularly on BBC One’s Rip Off Britain and ITV’s Good Morning Britain. David was joined by Johny Cassidy, Business and Economics Journalist for BBC Business. His work also includes the Inside Track section of Business Live, where entrepreneurs and bosses from global companies talk about their industries and the issues they face. Tessa McCann, TV News Editor for CNBC also joined the discussion. She helps run the news desk team to create compelling coverage in the short and long-term, with extensive experience producing breaking news and daily coverage in the studio and on the field.